We had prayed and hoped that it would be so for this pair of lovely birds nesting at our garden porch! Somewhat similar like that experienced by another pair that successfully fledged their chicks almost 3 years ago at the same location. 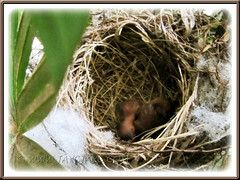 Feb. 13-16: I watched their arrival as they recce for a safe temporary home at our garden porch. Nest-building was swift, took about 3-4 days to complete. 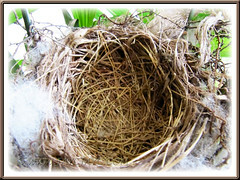 Nest consisted mainly of twigs, dried leaves and cotton that were cleverly woven and fastened onto the stem and leaf petioles of our Lady Palm (Rhapis excelsa). 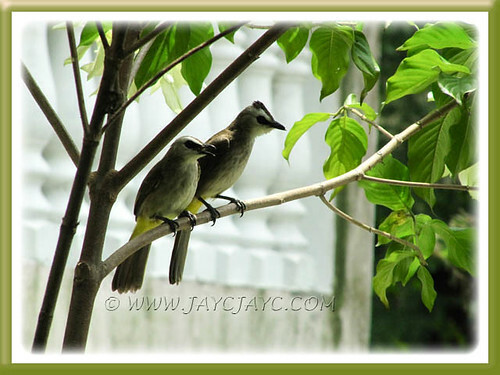 For several years, these potted palm trees have been a magnet for potential bulbul breeders. Conducive as they’re sheltered from the sun and rain. We’re glad to share our garden space with them. Feb. 24 or 25: Two beautifully speckled rusty-brown eggs were laid about 9-10 days after the nest was built. Wow! We’re so happy for the mother and father! The parents, Pycnonotus luteolus (White-browed Bulbul) Pycnonotus goiavier (Yellow-vented Bulbul), perched on the Mussaenda philippica ‘Aurorae’ (White Mussaenda) tree at our frontyard, celebrating the breeding event, with a typical clutch of 2 eggs. We could hear them rejoicing outside with much chirping, chattering and singing. Another pair was seen that morning too. Were they the proud grand-parents? Is there such a thing as extended family among the feathered creatures, I wonder! March 5: How lovely! 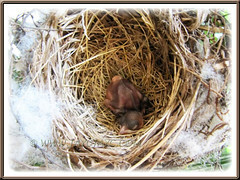 The first baby bird emerged from the egg, 9-10 days later, probably hatched in the early morning. So sweet with such tiny wings as seen in photo captured around 10 am. Reminds me of honey-glazed roasted chicken! March 5: The second hatchling came forth, probably a few hours later. Queer-looking and featherless in a lovely way!. Photo captured around 4.30 pm. Then, disaster struck! Sorrow unfold! March 7: Oh My God! What a shocking find around 10 am! Only one hatchling remained, the other was probably gobbled by a rat or squirrel! More likely the former as we noticed some fresh faeces nearby. How very sad! 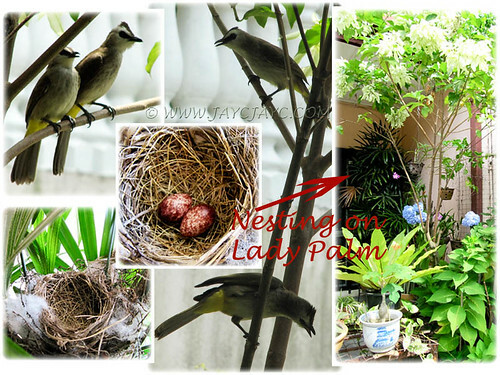 March 8: White-browed Yellow-vented Bulbul’s nest, devoid of her young the next day! We guessed that something was amiss as the bulbuls weren’t seen flying in and out as they normally do. So, around 3 pm, I took a shot and my worst fear was confirmed. Ouch! How very depressing and sorrowful for the new parents who’d desired for a family! Their joy was so short-lived. Just a couple of days ago they were happily bringing food (like the mother bird in the right image) and feeding their chicks, surely not expecting that their babies would be snatched away so suddenly. What a drastic experience with dreams shattered! Seeing the anguished pair appearing again the next morning after their loss, as if in mourning, evoked a profound sadness in me. We pray that they’d be comforted and look hopefully forward to many successful breeding and fledging of their young in the near future. We’d like to dedicate this article to the countless couples worldwide who have experienced miscarriages or lost their babies at birth. May they experience God’s comfort and peace, and be strengthened by His boundless mercy and everlasting love. Oh, Jacques, the bubuls are really very pretty. I was so happy reading the begining and then so sad. 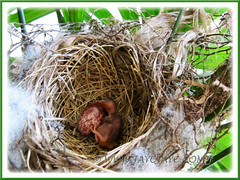 It is really difficult for the young birdies to make it to adulthood in our concrete jungle. There are so many predators at large. All the more reason for us to provide a home for them in our gardens. Indeed, A. Belle.. cute and glowing like human couples waiting for their first-born! We’ve left the well-constructed nest as is hoping that they’d return for a second attempt at breeding. 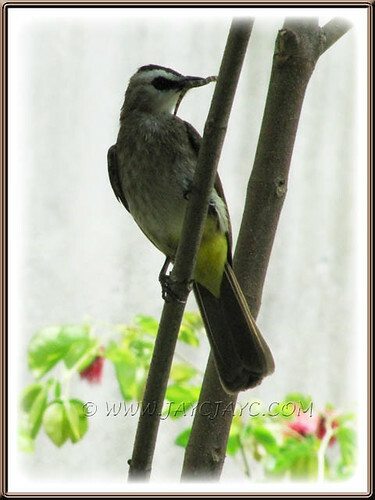 hi Jac.this yellow-vented bulbul nesting record is interesting.but since they are nesting in urban area, they are many predators.not only rats, reptiles and birds also feed on nestlings and eggs. Thanks, Wengchun! Agreed, but it’s so sad when such sad events happen in our own garden. Aargh… just a couple of days ago, we spotted a squirrel rummaging the nest again, hoping for a meal! Sorry to hear of your loss, Michelle. Hope time had healed your loss as had done for us when I miscarried our first 3.5-month-old foetus. Take care and God bless.